The “RC” is our premier meeting and dining facility. The lodge is separated into three main areas: the Great Room, the Blue Room – our carpeted meeting room and the Dining Room. 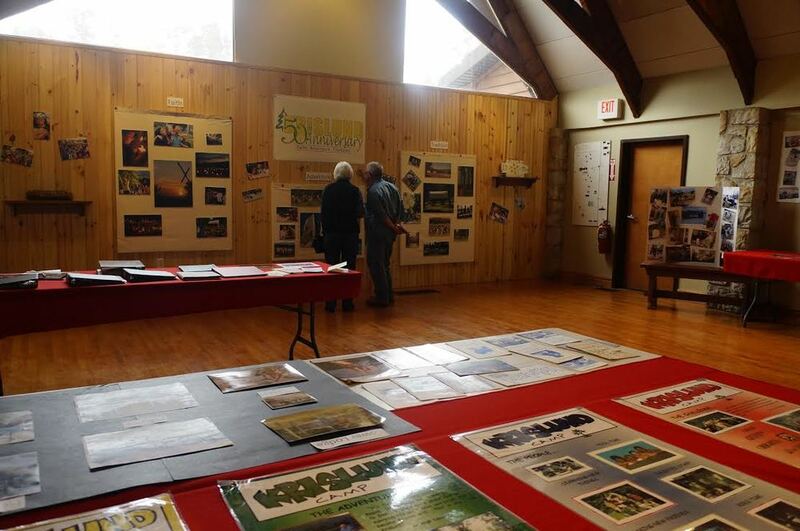 All rooms are open to each other making this facility great for large group activities, games or entertainment. Handicap-accessible. In the lobby area of the RC, you can enjoy a cozy seating area with large stone fireplace. This space is great for reception tables or guest registration and it’s adjacent to the Krislund Kafe’, our hot beverage bar. Open for our retreat groups during select hours, the Krislund Kafe’ serves a great selection of gourmet coffees, lattes, hot cider and other specialty drinks for reasonable prices. The Kafe is just a few steps away from the meeting spaces but it is semi-private, making it a nice quiet place to come and relax over a great cup of coffee. 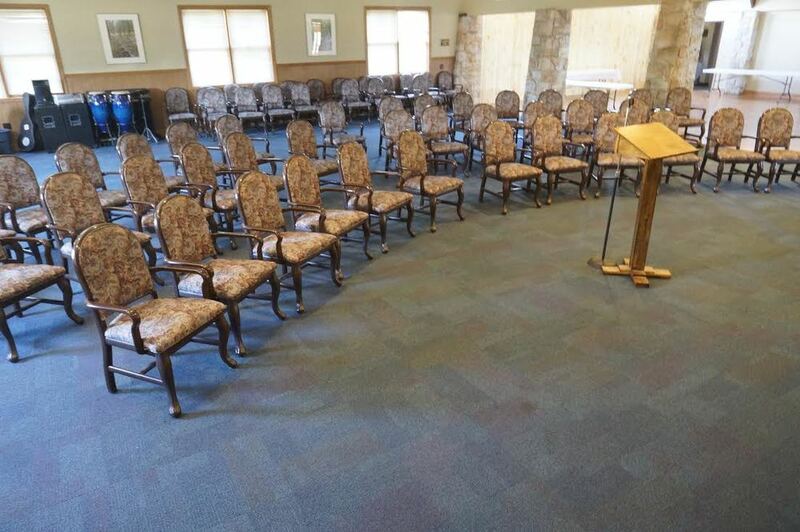 Our newest meeting space in the Retreat Center is called the Gathering Place. This is a private room, designed for small group meetings and casual dining. It has wi-fi access, a kitchenette and it’s own outside entrance facing the cabins, making it ideal for breakout sessions or meetings for under 20 people. Formerly known as the Upper Lodge, Fellowship Lodge has seen a dramatic transformation. The four cabins formerly surrounding the lodge have been carefully deconstructed and their materials reused in the expansion of the main lodge. Fellowship Lodge has four attached bunk rooms each equipped with adult friendly bunks (full-size mattresses), two sleeper sofas, a large meeting table with eight chairs, a walk-in closet, and its own personal bathroom. 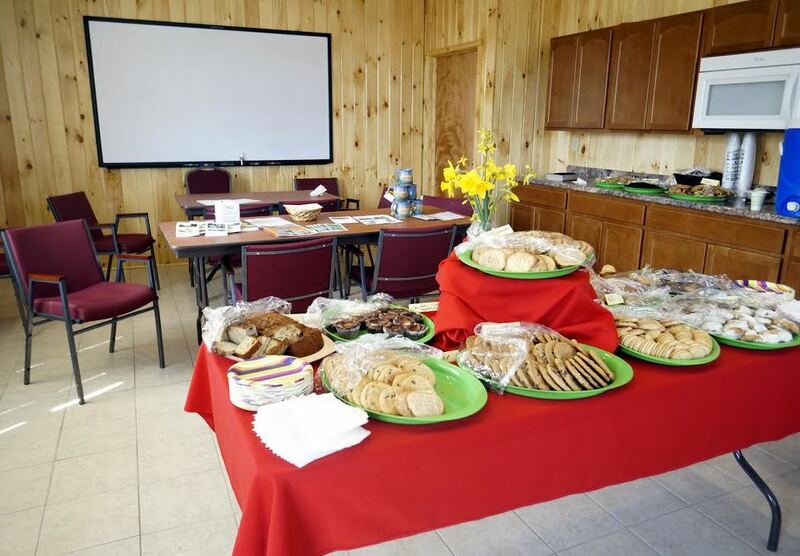 The lodge has a kitchen, a great meeting space with a beautiful stone fireplace, and a spacious deck with comfortable Adirondack chairs to sit and enjoy the peaceful surroundings and spectacular views. 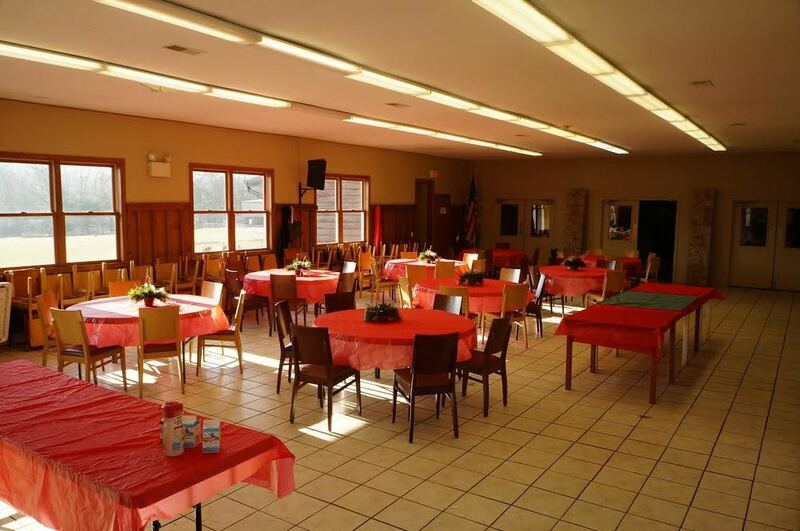 This space is ideal for family reunions, adult gatherings and youth events! Our newest lodge offers three bunk rooms with bunk beds holding twin-size mattresses. Each bunkroom has its own private bathroom & shower. The great room with its cathedral ceiling, large glass windows and stone fireplace provides a comfortable area for meeting and relaxing. The expansive deck overlooks the forest and Roaring Run. The fully-equipped kitchen is ready for large-group meals that can be served in the dining area with seating for 30. An additional bathroom is available to the meeting and dining spaces. Handicapped accessible. Our individual cabins have two double beds, private bathroom with shower, electric heat and air conditioning. Cozy front porches are equipped with Adirondack chairs. Two units are handicap accessible and one unit has a kitchenette. 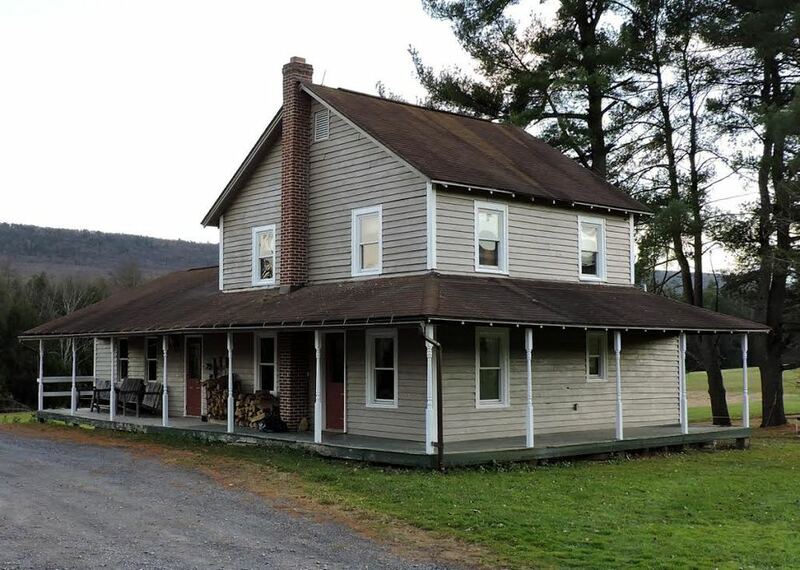 The Brown House is a two-story farmhouse perfect for a small group or to be used as an ‘over-flow’ if your group exceeds the capacity in another lodge. The Brown House has three bedrooms, two full bathrooms, and a kitchen. 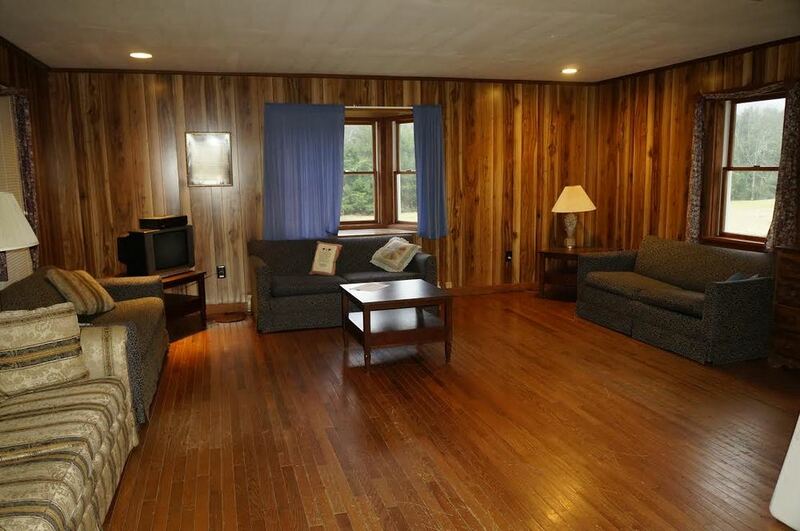 There are also two living rooms open to one another giving you enough space for everyone to be comfortable. There is a fantastic wood burning stove to make any winter retreat feel cozy and warm.